It took 120 minutes and an unfortunate injury to Cristiano Ronaldo but Portugal still went on to win a major trophy, 12 years after they came so close on home soil, but lost to Greece in the final. 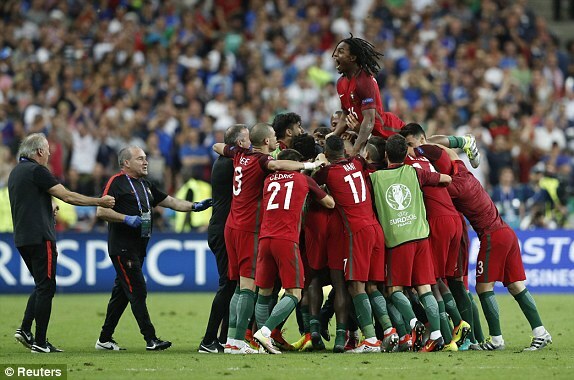 Substitute Eder – who probably wouldn’t have played had Ronaldo not been taken off – produced a splendid goal as he finished his great individual effort with a poisonous shot from around 23 metres out into the left side of the goal. That goal would be probably be the most important in Ronaldo’s international career even though he wasn’t the scorer. It was a night that Ronaldo would have reveled in, and would have loved to take active part in but he probably won’t care about that right now, as he has finally won a major tournament with the Portugal national side at the grand age of 31, despite having his night cut short. The Real Madrid star’s night was cut short when he was tackled by Dimitri Payet and while there was no malicious intent, it was the first step to seeing Ronaldo out of the game. Nodding his head in anguish and in tears, he went off to receive treatment but the grim look on his face suggested it would take a miracle for him to successfully complete the game. And so it proved, that he couldn’t continue the game and was promptly taken off and replaced by Ricardo Quaresma. The French still had the bulk of possession and threatened intermittently, but they met in formidable force in Portugal goalkeeper Rui Patricio. The Portuguese were also not without their chances, as they had a few pops at goal but were denied by the very agile and impressive Hugo Lloris in goal for Les Bleus. It is safe to say it was a night when two goalkeepers distinguished themselves even though only one went on to win. But before the game went into extra time, France had the chance to seal a win in stoppage time of normal time when substitute Pierre Andre Gignac sold a dummy to Pepe and his shot found the near post, beating Rui Patricio but hit the woodwork. Portugal’s tactic of sitting deep and trying to catch France on the break became all the more imperative following Ronaldo’s injury, which meant their biggest attacking threat had been taken off and they had to solidify their defensive cohesion.